In May 2018, General Cigar announced a partnership between A.J. Fernandez, the Diesel cigar brand, and Rabbit Hole Bourbon. Those entities teamed up to create Whiskey Row, a new cigar line featuring bourbon barrel-aged binder leaves from a “proprietary process” developed by Fernandez. This concept was “brought to life in 2016 when Rabbit Hole Bourbon barrels arrived at Tabalacera A.J. Fernandez in Esteli, Nicaragua,” reads a press release. “A.J. placed the Mexican San Andrés binder in the bourbon barrels in a special configuration. 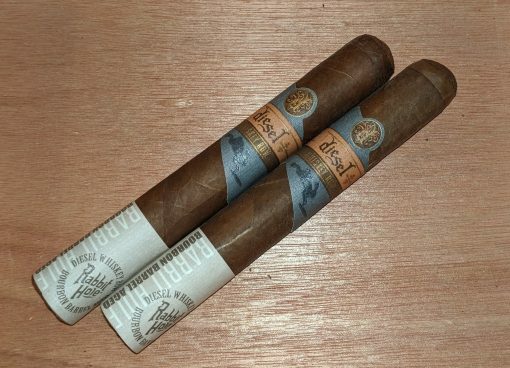 The tobacco was left to rest inside the barrels, and the amount of air inside was controlled at regular intervals to ensure the bourbon flavors were imparted evenly.” In addition to this binder, Diesel Whiskey Row includes an Ecuadorian Habano wrapper aged for five years and Nicaraguan filler tobaccos aged for five to eight years. The Robusto (5.5 x 52) retails for $7.49. It isn’t bourbon-y, per se, but instead features hearty, heavy leather notes with white pepper, black coffee, and dry earth. In my book, I can’t enthusiastically recommend this; frankly, unless you’re a huge fan of leather notes, it’s just OK. I just had this yesterday for the first time.. your review is spot on. Just wish I had read it sooner. Keep up the great work.